Efficient lentivector delivery of gRNA for our Two Vector Cas9 SmartNuclease System—EF1α-Blasticidin-H1-gRNA. Efficiently deliver gRNA using our Cas9 SmartNuclease™ Lentivector System. 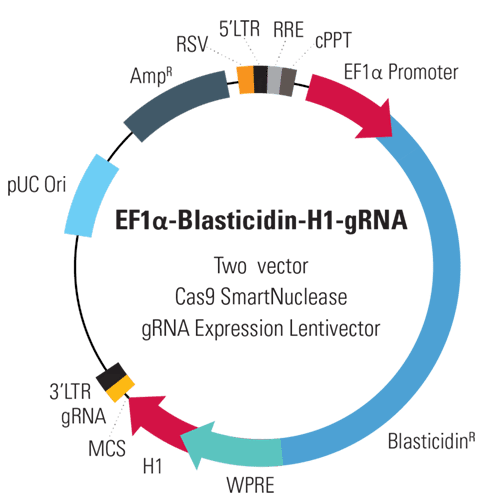 Great for when you want to create stable Cas9 editing cell lines and/or would like to edit the genome of a cell line that is resistant to transfection by plasmids, the EF1α-Blasticidin-H1-gRNA Two Vector Cas9 SmartNuclease gRNA Expression Lentivector works with any of our Cas9 SmartNuclease Lentivectors.